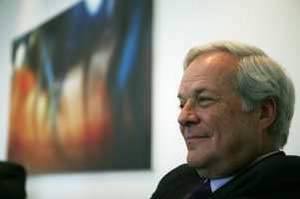 Baron David de Rothschild, the head of the Rothschild bank. DUBAI: Gulf states buying farmland in developing nations for food security face the risk of damaging their reputation as international investors as the deals are seen as land grabs, a Rothschild executive said yesterday. Gulf Arab countries, heavily reliant on food imports, have been buying farmland in developing nations to ensure food security. "There is a reputation risk as many of these deals are done on a government to government level," said Christopher Hawley, director of international investment bank Rothschild in Dubai, at a roundtable on food security. "An element of self policing must be adopted when dealing with farmland. Foreign land acquisitions have provoked opposition from some sectors and from many farmers in developing nations. In Madagascar, an attempt by South Korea's Daewoo Logistics to lease an area of land larger than Qatar to grow food for export contributed to the unpopularity of former leader Marc Ravalomanana, who was toppled in March. In April, the United Nations expressed concern that farmers' rights in developing nations could be compromised as rich countries buy farmland to secure food supplies. In the past few years, Gulf states including Saudi Arabia, Kuwait and the United Arab Emirates have bought farmland in Sudan, the largest recipient of food aid from the World Food Program (WFP). "There are political risks involved in these deals... especially with deals made in African countries such as Sudan," said Hawley. "But on the other hand, developing countries cannot afford modern farming equipment to increase their productivity, that's why foreign investment is needed. Rothschild is advising nations and institutions including those in the Gulf seeking to invest in agriculture, said Hawley. Last year Rothschild signed a co-operation agreement with Dutch bank Rabobank, a global food and agricultural bank, to facilitate investment for companies interested in the agricultural sector. Rabobank is raising a fund for land purchases, Hawley said. The key with investing in agriculture is diversifying your investments in different regions, so if one place gets hit by a drought you can guarantee food supplies from another region," he said. "Regions we see with a lot of potential for buying land are Australia, Brazil and parts of central and eastern Europe." So far foreign investors have acquired some 15-20 million hectares of farmland in poorer countries since 2006, according to the International Food Policy Research Institute.